The Blackbird star says she hopes her new film will spark conversations about homophobia and how it has devastated far too many lives. In the opening scene of Blackbird, a new film directed by Patrik-Ian Polk (Noah’s Arc), the main character, Randy Rousseau (Julian Walker), is singing as the lead of his church choir in Hattiesburg, Miss. In the middle of the performance, a fellow singer surprises Randy — and the audience — with a declaration of love. The two disrobe in front of the shocked congregation and begin to kiss. There are gasps. One girl faints. And then Randy wakes up. It was this scene that grabbed the attention of Mo’Nique, who plays Randy’s devout and mentally anguished mother — her first performance since winning an Oscar for Precious. In this scene she immediately recognized the importance of what was being addressed, and she ultimately also signed on as executive producer alongside her husband, Sidney Hicks. The film, based on a novel written nearly three decades ago by Larry Duplechan, tackles a number of hot-button issues that have not been addressed in major films before: homophobia in the black church, down-low culture, and even abortion, mental illness, and child abduction. But overall, the Precious star says Blackbird is her “love letter” to the gay men she knew growing up who may have shared the experience of being the victims of homophobia, of being trapped in the closet like Randy. These are men who, despite their struggles, “accepted me with open arms,” she says. Recently, Mo’Nique made headlines when she had been offered the part of Cookie Lyon on the hit Fox show Empire by Lee Daniels, its gay co-creator and her director on Precious. Coincidentally, these creative projects both address homophobia in the family unit — the patriarch of the family on Empire, Lucious Lyon, struggles to accept his gay son, Jamal, much as Mo’Nique’s character struggles to accept her (also musically talented) son, Randy. “I haven’t actually seen Empire yet. I have small children. So if it’s not on Disney or Nickelodeon…” she says with a laugh. And while her character has a very dramatic reaction to her son’s sexuality in Blackbird, she loves that the film can also show how a black father, who in her production is played by Isaiah Washington, can love and support his son. “What I appreciate about Blackbird is, when you watch Isaiah Washington, who plays Randy Rousseau’s father, it’s such a beautiful relationship, because you have this man saying to his son, ‘I brought you here, and I love you regardless. And no one can tell you how to be a man,’” she says. 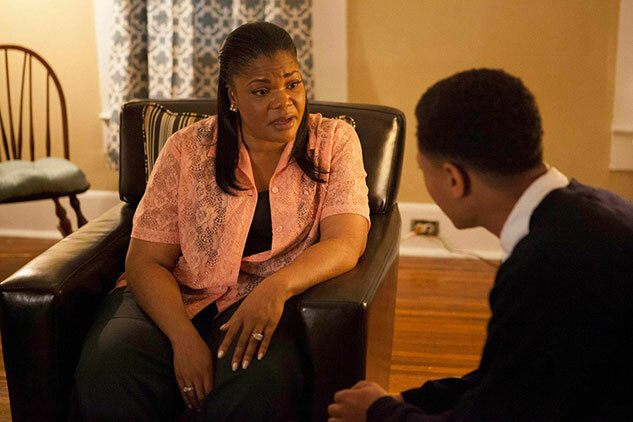 Although Mo’Nique’s character in Blackbird is unaccepting of her son due to his sexual orientation, she is very much the opposite in real-life. If any of her four sons were gay, “they wouldn’t have to come out,” she says, because they know they will be accepted. “They’re our babies. So whomever they were made to be, we love ’em,” she says. Although three of her sons are still too young to see Blackbird, Mo’Nique looks forward to the day they will see it and learn the lessons of acceptance that the movie contains. “We’re raising them to understand people are just people. And people can’t control who they were born to be. Nor should they have to,” she adds. Ultimately, she hopes that people will see this film and take away a similar message of acceptance, which they will share at work, at the dinner table, and perhaps most importantly, at the Sunday church service. Blackbird is out in theaters this weekend. Watch the trailer below. Next Article Show on transgender kids, too much?